The first installment of a long and detailed critique of Myer's arguments for Oswald's culpability in the Tippit murder. 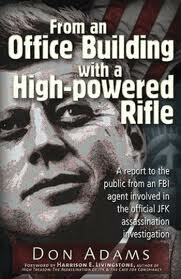 [Adams] is remarkably open and honest about being inexperienced on the Milteer assignment and about his being unaccustomed in terms of research on the JFK case. Therefore, when he comes to naming who he thinks are the 'players and the patsies", he readily acknowledges that other, more informed, researchers have worked the beat before. This selflessnes ... is something of a rarity, notes Seamus Coogan. What Baker does with the JFK and Watergate episodes is symptomatic of the rest of the book. He wants to somehow implicate the Bushes in crimes for which there is next to no evidence, while not reporting on the ones for which there is plenty of evidence, writes Jim DiEugenio. Obituary from the Washington Post for the onetime FBI agent who ran a Washington company that he said carried out secret missions for the Central Intelligence Agency. Mark Lane wrote that the Warren Report dishonored "those who wrote it little more than those who praise it." This book makes you feel the sting of that dishonor more than any other book that I know. But, as with the best work in the field, it helps us transcend that shame with the beauty and power of pure understanding, writes Jim DiEugenio. For me, and for most of his longtime admirers, the highlights of this distinguished and fascinating book were the chapters on the Garrison inquiry and the one on the Robert Kennedy murder, writes Jim DiEugenio.